Giới thiệu công nghệ trao đổi ion0 out of 50 based on 0 voters. Beds of ion exchange resins efficiently remove ionized species from water by exchanging them for H+ and OH- ions. The resins are sub 1 mm porous beads made of highly cross-linked insoluble polymers with large numbers of strongly ionic exchange sites. Ions in solution migrate into the beads, where, as a function of their relative charge densities (charge per hydrated volume), they compete for the exchange sites. 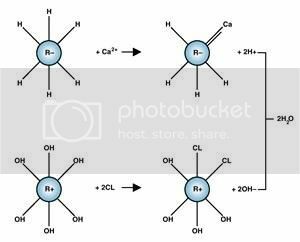 Deionization beads are either cationic or anionic and exchange either hydrogen ions for cations e.g. sodium, calcium and aluminium or hydroxyl ions for anions e.g. chloride, nitrate and sulfate. The hydrogen ion from the cation exchanger unites with the hydroxyl ion of the anion exchanger to form pure water. Beds of ion exchange resins are available as cartridges or cylinders and are typically used for a period of time and then replaced, when cations and anions have replaced most of the H+ and OH- active sites in the resins.